If you're thinking of beginning an ambitious new writing project, you might consider writing the first book of a series. For some, the idea of writing a single book is a daunting enough task; thinking of writing a series of books might seem crazy from the outset. However, if you like to set your sights big, you might be surprised how easy it can be to conceive of writing a book series. Sometimes books like this become a series as you go along, in that you continue to uncover so much material as you write that you will need several volumes to cover it all. Other times writers set out from the start with a sprawling tale and intend from the beginning to deliver it in a number of different books. No matter which type of series of books you intend to write, certain things will need to be accomplished in the first book. Every book should be written as a stand-alone whether it is the first or of the fifteenth in the series. Always assume a book could be your reader's first exposure to your world. Every character will need to be reintroduced to the reader in subsequent novels. 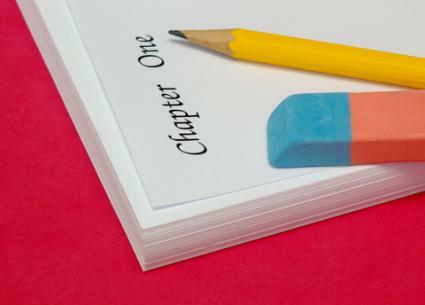 When writing your first book, be sure to keep a file that gives you standard information on that character: height, age, eye and hair color and any basic facts about the character that are vital. For example, if the character began in the first book at a young age, but married in the third and had a child in the fourth-keep track of this information; it will save you time and frustration in later books. Write the first book as the only book you plan to write, but keep the story focused on the main characters in that tale. Because writers come in three different types (plotters, pantsers, and those who combine the two), you have three different approaches you can take to writing a series. Unplanned series - You come up with a great idea, you build your world, you populate it with characters and you discover that these supporting characters have stories of their own. Planned series - Planning a series of books about a group of characters begins with creating a world "map" for the series. The first novel builds a framework for the rest of the series. Try to avoid leaving dangling plot threads that will frustrate readers if you never write a second book. At the end of the book, the reader must feel satisfied with the experience. What is the common thread that ties the characters and novel together? Are they all military personnel? Do they live in the same town? Did they go to high school together? This common thread helps you establish your setting and the interpersonal relationships between the characters. What genre are you writing? Is it an urban fantasy? Romance? Mystery? What is the overall arc of the series versus the individual arc of the current novel? Urban fantasy typically follows the same character as the narrator through several books. Romance typically follows a new couple and has a new narrator in each book. Mysteries may do either. Answering these questions helps you build your framework for the first book. The individual story arc for your first book (and each subsequent book in the series) should be answered by the time the reader finishes. An overall story arc, however, can be broken down to reveal pieces to the reader through each book. For example, in J.D. Robb's In Death series, which centers around Eve Dallas and her husband Roarke, Eve always has a new case to solve in each novel, but the continuing thread of her marriage and life with Roarke, their friends and lives builds through each novel. The successful series is one that has multiple entry points (in other words, every novel can stand on its own) for new readers to discover the author. The elements you want to keep track of for a series include timeline, characters, conflict, settings, and style. While these are not hard and fast rules they also help you develop your world, answer questions you may not have foreseen and provide you with reference material for later books. A timeline will save you a tremendous amount of time in frustration and headaches. Readers love series, but they pay attention to minute details. If you state in your first book that your main character has never been married, but in a later book, a formerly unheard of ex-wife enters the picture, you need to have the answers ready for them. If you state that two characters have never met before a novel, but a later entry into the series suggests a different time when they met, your readers will notice. Timelines don't have to be complicated, but you need to keep track of key points in the characters' lives as well as the life of the series. The most important things in any work of fiction are strong characters. In a single, one installment novel characters are important, but in a series of books they are even more essential. The reason for this is obvious; the longer you plan to spend with these same characters, the more compelling they have to be from the outset. In the first installment, the writer's primary job is to introduce the characters to the audience. You will want to make a list of the core group of characters that your series will lean on and make sure you bring them to life in the first book. You might have other characters that you know you will not introduce until later, but you want to keep them in mind as you write your first book so you can work your story forward in the right way until it's time to introduce them. Conflict is as important as characters in a good story. If your characters don't have issues that challenge them, the audience will not develop any meaningful feelings for them, and therefore won't engage with your text. Conflict will be treated differently in an epic than it is in a serial. In an epic series of books, the major conflict might build up slowly and might not get revealed until later books. You will need to have smaller, minor conflicts in the first book that the characters have to overcome along the way to keep the reader interested. In serial books, the conflict and resolution has to all occur in the same text, so the first book needs to set the tone for what kinds of issues these characters will deal with later. Outside of characters and conflict, the main thing you want to establish is to let readers know what reading a series of books by you would be like. In other words, you want to make sure that your readers get a feel for your style; hopefully, they'll like it and will want to continue reading along with you. Consider what your strengths and weaknesses are as a writer. If your style uses humor, make sure your first book utilizes humor. The first book of a series is your interview with your audience. You want to let them know as much about your writing and your story as possible, so don't hold back. If you are thinking of writing a series of books, there are several potential paths that your series will eventually take. Epics - These novels follow multiple characters through long conflicts and adventures. Multiple viewpoints are played out on the page, although there may only be one narrator. Think of stories like Lord of the Rings or The Hitchhiker's Guide to the Galaxy. Serials - Serial novels are written in a way where each book stands alone but uses the same characters. Examples include Twilight, The Babysitter's Club and In Death. Series - Romance series do not always follow the same characters. Subsequent novels are set in the same world but focus on a new couple. Characters introduced in earlier books return as part of the supporting cast. Books written in this fashion include Nalini Singh's Psy-Changeling series and Kay Hooper's Bishop books. It is important to remember, whether you're writing a standalone or a first book in a series, that the book you're working on is your focus. Write the best story you can, invest yourself in your characters and your plot. Every book you write is the most important book while you are writing it. Deliver a solid, compelling story to the reader. Write with a sense of hooking your readers in the moment, and allow your characters the space to grow into the other books of your series.